Lazy Latte Lovers rejoice! 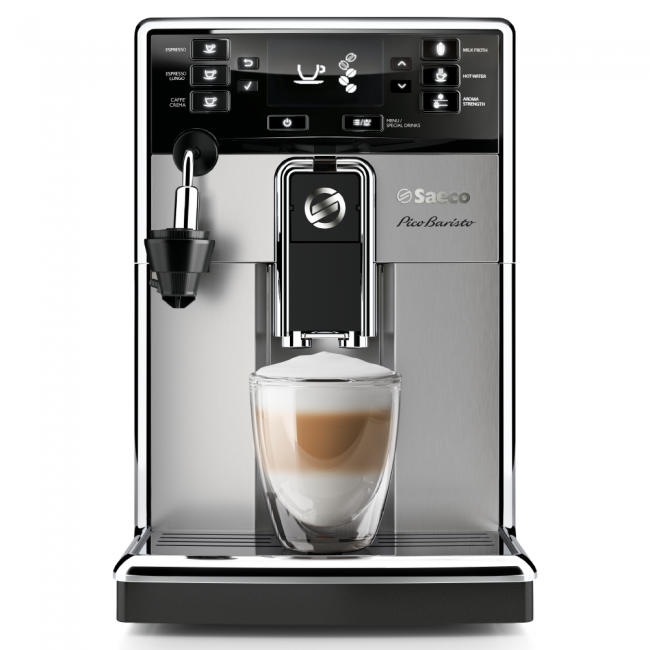 The Saeco PicoBaristo will have you well-caffeinated with little work and even less maintenance. Designed to grind, dose brew and steam all on its own, you're only a couple buttons away from sweet espresso. Saeco put together some of their best effort-saving innovations, including their brand new AquaClean filter that promises to greatly reduce the need to descale their machine. Milk Mastery - The automatic cappucinatore attachment makes short work of steaming milk for cappuccinos. Easy Programming - A new, more intuitive menu layout makes it easy to change settings on the fly. AquaClean Filter - Descale less often, and get an alert for exactly when you need to change your water filter. Café Crema - A dedicated 'Café Crema' button makes a full-dosed long shot that tastes like sweeter cup of drip coffee. Top Water and Beans - Both beans and water are accessible from the top of the machine, making it easy to top up both as needed. Washable Brew Group - Dishwasher safe and removable by hand, the Saeco brew unit makes maintenance easy. Adjustable Grinder - 10 unique grind settings make it easy to find your favorite espresso flavor. Low Maintenance - Saeco's dishwasher-safe brew unit and low-descale AquaClean filter help take the work out of home espresso. Good Menus - The dedicated back and select buttons on the PicoBaristo go a long way to improving Saeco's menu navigation and layout. Top Tank - Moving the water tank to the top of the machine means you can refill the machine without removing the tank at all. Magnet - The PicoBaristo's bean hopper magnet stands out slightly from the lid of the machine. Make sure that you don't put too much stress on the mount lest you lose it! Top Tank - Depending on your cabinet height, this may also mean you have to pull out your machine to refill the tank. Saeco's new AquaClean filter system seeks to eliminate the regular need to descale similar to Jura's new CLEARYL Smart Filters. 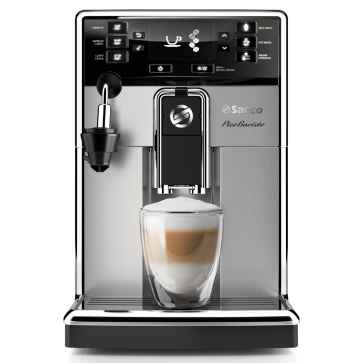 Like the Saeco Moltio, the PicoBaristo has buttons on either side of the drip tray that needs to be pushed in to remove. Soap out drip tray and water reservoir weekly.